One of the most pivotal experiences of my life took place when I was 23 years old. It was one of those times that as I look back on it, I can see how the trajectory of my life changed because of a simple, yet profound decision that was made. It was February of 1997 and I was at a small regional Impact gathering in Detroit that was designed as a follow-up to Impact '96, a national conference primarily geared towards African American college students. I, along with another white Cru staff member, took a handful of African American students from Kent State University to join with like-minded people and discuss what it would look like to have an Impact movement on our campuses. There was much I appreciated about the weekend. I loved the vibrant praise & worship that we experienced. I was blown away by the vulnerability that students demonstrated as they shared about the ways that God had moved in their lives and the places He had brought them from. I valued the rousing preaching that I heard and the deep concern for college students to live out their faith in the context of their community resonated deep within me. However, there was one little problem. I was white! I silently asked myself, "What difference can I really make? I agree with everything that is being talked about but I'm not black. What can I do?" And then during a time of concentrated prayer, I felt like God was speaking to me. It was as if he was saying, "You can start by making a difference in your daily life. You hear jokes and comments that you know to be racially insensitive and you do nothing. Start by addressing those things among your friends and family." At that moment, I committed to address the injustices that I saw in my circle of friends and would leave the results to God. Within days of having returned from this weekend conference, I was put to the test about whether I had truly meant what I had committed to. While watching a television program together, a friend made the following comment about an actress: "She's not bad looking for a black woman." As my heart raced, I knew I needed to say something. But a number of questions bounced around in my head: How would my friend respond? Was I overreacting? I mean, he didn't really mean anything hurtful by that, did he?" I decided to to take a step of faith and say something. I explained that while he didn't probably mean anything negative by it, his comment could be interpreted as racist. His comment implied that most African American women were not attractive and he was a bit surprised that here was someone that he considered beautiful. I was bothered by his perspective and explained why. We ended up having a really good conversation and I was even able to bring up some other things that he had said in my presence about African Americans that I was troubled by but had not said anything. It was what could be considered a "teachable moment." Both for my friend and for me. He was forced to do a heart examination and come to a realization that he harbored some attitudes and prejudices towards African Americans that he wasn't even aware were present. I learned that when I confronted injustices that I saw in a spirit of grace and truth that God could work through that to make a difference in black/white relations. Amazingly, God had used me to make a small difference about these issues that were so important to me! From there, I sought to take small steps of faith to make a difference right where I was located. I helped to be a part of the birth of Impact at Kent State, a movement that is still in existence to this day, and eventually other campuses in northeastern Ohio. 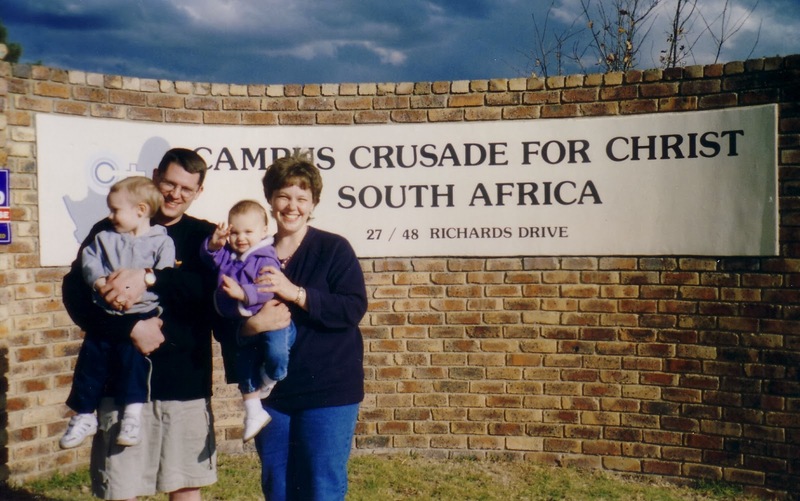 I staffed a missions trip that summer of '97 in Virginia Beach in which ethnic minority ministry and racial reconciliation were part of the focus. (I met my wife, Lori, that summer and I've been so thankful that we've been on this journey together all these years.) In addition, I began to see God use me in the lives of other Cru staff members and students to increase awareness of issues of race and culture and to be an instrument of racial reconciliation. And I've been seeking to take those small steps of faith for the past 16+ years. This journey has led me to places and people I would have never imagined. I now have the privilege of leading in a respected national organization that, while improving, has much to learn when it comes to these same matters of race, culture and justice. As part of my responsibilities, I get the opportunity to invest in ethnic minorities leaders so that they can be all that God has created them to me and to help majority culture missionaries become better equipped to minister cross-culturally. While there has been much joy in my ministry experiences, there has also been pain. I've made mistakes along the way and have unintentionally hurt others by the things I've said and done. People of my own culture have made judgments about me because I don't fit the box they sometimes want to place me in. And since I'm regularly in cultural settings that are not my own, I experience heightened fears of accidentally doing or saying something offensive. I wouldn't say that my ministry calling has been easy or comfortable. In fact, it has stretched me in ways that I haven't even considered. It has often been a very lonely existence where I frequently feel out of place and never fully at home. But the privilege that I've had to learn from friends of other cultural backgrounds, to taste some of their life experiences and to hear their stories? I wouldn't trade that for anything. God has worked in my life as a white person to be involved in the lives of ethnic minorities in ways that I didn't think would be possible back when I was 23. And I truly believe that I'm a better Christian and a better person because of it. And it all started with a small step of faith. "The United States is projected to be the largest and fastest-growing destination for foreign students over the next decade, according to a report released on Tuesday by the British Council's Education Intelligence global-research service. But American universities' heavy reliance on students from China and India could make them vulnerable if an economic slowdown in those and other emerging countries put a college degree—particularly a costly foreign diploma—out of the reach of many families. India and China are predicted to account for fully two-thirds of the growth in international students at American institutions from 2011 to 2024, the research shows. Worldwide, the two countries are expected to contribute 35 percent of total foreign-student growth during the forecast period. The report, "The Future of the World's Mobile Students to 2024," examines the demographic and economic drivers of higher-education enrollments in 56 countries. Its authors project that overall enrollments will climb by 32 million, or 1.4 percent per year, to 196 million globally. One-third of those globally mobile students will hail from either India or China. While the number of Chinese students going overseas will continue to grow, the report suggests, the rate of increase is likely to slow compared with recent years. From 2009 to 2011, the number of outbound Chinese students shot up by 150,000, although an earlier British Council study had forecast a far-smaller increase, of just 13,000. In the next decade, the number of Chinese students pursuing an international degree is expected to climb by a more modest 132,000, to 855,000." Why Aren't More American Churches Ethnically Diverse? If you asked the average American evangelical Christian if they wished their church was more ethnically diverse, my guess is that many would respond in the positive. However, few of us attend churches that could truly be considered diverse. Because of the type of ministry that I'm involved with in reaching out to ethnic minority college students, I often find myself in discussions about why churches aren't more diverse and what can be done to change those realities. Writer Christena Cleveland has offered a helpful summary of a recently published article in the Annual Review of Sociology from sociologists Korie Edwards, Brad Christerson and Michael Emerson entitled "Race, Religious Organizations, and Integration." Which types of churches are most likely to be diverse? Statistically, the most important predictor of racial diversity is religious tradition. Non-Christian churches (27%) and Catholic churches (15%) are far more diverse than Protestant churches (5%). The second most important predictor – at least for Christian denominations – is the historical position on race relations. Christian denominations with a long history of fighting for racial justice are more likely to have diverse congregations today. The best example of this is the Catholic Church, which has a long history of racial justice as well as a centralized government that organizes and communicates a unified stance on issues of race. 2. Create a small group culture within the congregation (including some racially homogeneous ones). 3. Integrate diverse music genres in the worship service. 4. Create and carry out special programs that specifically address racial and ethnic issues. 5. Encourage different racial groups to share their unique experiences, cultural elements and perspectives with the whole church. 6. Diversify the “upfront” leadership – those who are on stage during the worship service or lead in other conspicuous ways. 1. Congregations with a charismatic/Pentecostal worship style are more likely to be diverse — presumably because it creates an inclusive and participatory environment. 2. Size – larger congregations tend to be more diverse. 3. Economic status – churches with higher income and well-educated congregants are more likely to be diverse. Ultimately, ethnically diverse congregations can only happen when Christians who are empowered by the Holy Spirit carry with them a loving, humble and sacrificial spirit that puts others before themselves. This kind of willingness to learn from others and step out of our comfort zone helps to create an environment in which a healthy, diverse community can thrive. To read more of Christena's summary please click here.